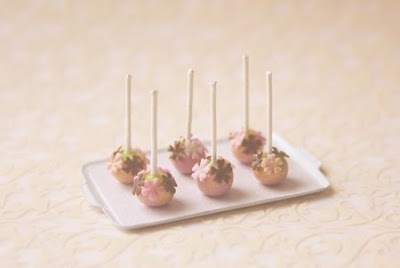 Cake pops - they were made famous by Bakerella. For those who are hearing cake pops for the first time, these are bite sized cakes served on a lollipop stick. Usually round in shapes, but there are many other seasonal shapes and patterns made. The cakes also have a coat of chocolate on them and design ranges from cute and whimsy to elegant. 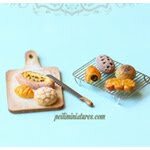 I saw some very pretty ones made by zalita of cupcake d'lights and I decided to try my hand on making them in dollhouse miniature scale. They are about 0.6cm in diameter. Including the stick, it's about 2cm tall. I'm going to try making other types of cake pops too. This time round, I made them in 2 different larger sizes. As you can see in the photo, I've put the 2 smaller size french rustic trays on the big one!! And yes, that's how big I made it, and it's the first time I made something so big that even my mom exclaimed that it was big. LOL. 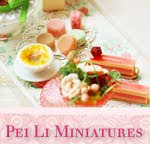 My mom have been so used to seeing dollhouse miniature scale items that she knows for now, how small things should be! But I'm so happy and proud of my accomplishment. Can you spot the dollhouse miniature french rustic tray there? My sweet friend Jacqueline has some interesting ideas with the french rustic tray on the left (in the photo below). The package has just left my home today, and is on its way to her. I now have to create another BIG tray, which is also going to be a custom order for another dear friend. She has some different ideas on how she would like to use it as well, and again more would be revealed as we have photos to show! I just love all the different ideas people have about my french rustic trays! :) It's so exciting! This is not the first time I made these kiwi tarts, but I've always different ideas to photograph them. Yesterday I tried with some meringues and strawberry short cake. I love it when I get shots that I'm happy with. 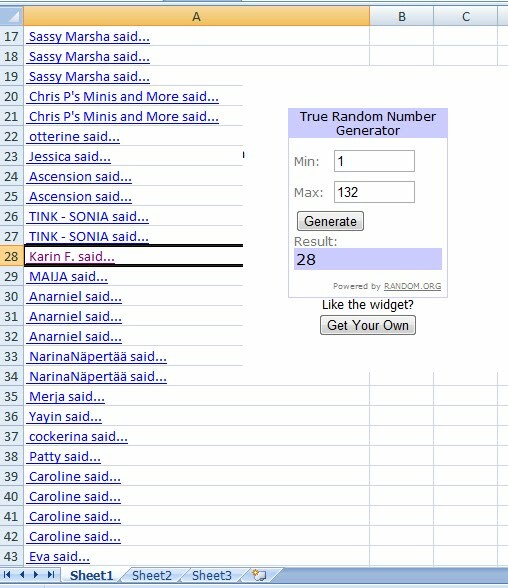 I'm so pleased to announce that Karin F is the winner of the bread box and purple hyacinth! I'm soo happy at this moment because my dollhouse miniatures made it into an international magazine! Big thank you to Frankie Magazine!!! I never thought I would make it into a real magazine, so that's a big thing to me. I went to the bookshop today and grabbed a copy. Amazingly, it seems there are quite a lot of people who read this magazine locally, as I understand that the previous issue was all sold out. I came to know of this magazine when my sweet friend Jacqueline was featured in the previous issue. For those who do not know, Frankie Magazine is geared towards women and men, featuring all sort of things like music, crafts, food, fashion, handmade creations, travel etc. The lovely cover of issue 42. Although 3 out of the 4 things featured in the photos were already sold before this was published, but they can be re-created if anyone's interested. The magazine is chock-full of beautiful photos. I was very intrigued with the idea of something rustic, and so I came up with this neat little basket which I filled it up with french assorted breads. 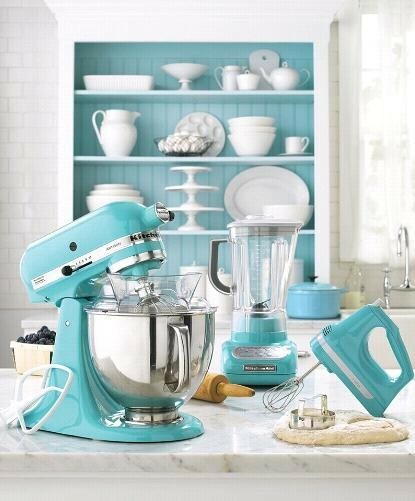 I am thinking of having it in other colours too, like blue, aqua green and pink. I typically don't use blue, but for this rustic tray, I'm really eyeing blue. What do you think? And oh, I'm having another really neat idea to use this dollhouse miniature rustic french basket too, and I'll show you again once I complete it. My most recent piece of work is a dollhouse miniature elegant cake display. When I started on this piece, all I know was that I wanted it to be pink. With that set, I scouted around for cake inspiration and saw this. A green tea mousse cake, and co-incidentally it was made in Singapore. Found at Orchard Hotel. 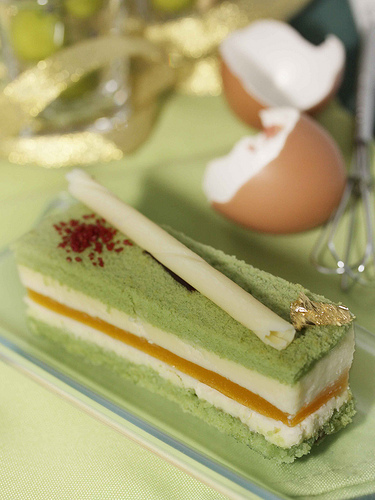 This green tea mousse is a unique combination of green tea sponge with mango jelly. So the Daily Specials for the day are Green Tea Slice Cake, Vanilla Bean Slice Cake and Strawberry Mont Blanc. Cake Shop logo was handmade as well. Available in my dollhouse miniatures store. I first attempted this last year, and both towers are now with their new collectors overseas. I still love it very much and so it was definitely in my to-do list. 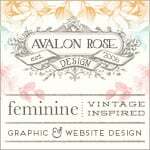 But I won't deny that it is rather time consuming to make this, as everything is handmade, including the roses. I'm also picky about colours and make sure the tones of roses fit into everything, but I'm so glad this is the final end product. The difference this time round is that I added tiny pink pearls to it. 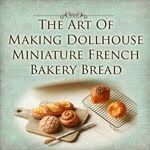 Click to see my other dollhouse miniatures creations. If you all do not know by now, I am a die hard fan of air dry clay and I use them in making all of my dollhouse miniatures. But today, I want to specifically talk about air dry clay. Probably all of you already know this, but yes there is a shelf life for Air Dry Clay – especially if you have opened the packet. There is also a shelf life for it even if you have not opened it. How can you tell? Well I mentioned this in my blog post here. You can tell by pressing onto the packet lightly. If you can press it easily, it is a fresh packet. Although this will take some experience to tell if the air dry clay is fresh or not. I have been using air dry clay for years now, and perhaps because I use them all the time, I have not been affected by the shelf life issue. With that said, it does not mean I consume it quickly because a packet last me for a LONG time. I’ve been using my packet of Hearty clay (the largest size packet) for more than 1 year, maybe 1.5 years now. I am close to the last bit of clay in the packet, and the quality is still good. This is also why I do not buy different colours of clay and keep them. I rather buy acrylic or oil colours and knead it into the clay. Why? Acrylic and oil colours are so much easier to store and they take so much less space than packets of clay. When you live in tight living spaces like I do, you will probably appreciate this tip more ;) Besides, oil colours (as far as I know) have no expiration dates. And a tube lasts forever. Here is how I store my air dry clay. Every time when you take a small amount of air dry clay to work, use cling wrap to wrap the packet tightly, before putting it into a ziplock bag. Then put the whole ziplock bag into an air tight container. I've been using this storage method for years now, which helps to keep my air dry clay in great condition for a long long time. The cling wrap tends to lose its “stickiness” after a while, so you can change the cling wrap once you find that it doesn’t cling onto your packet of clay after a while. Practicing good storage methods can help your air dry clay to last longer. This tip should be good for all brands and types of air dry clay. That’s all for this time! Hope this has been helpful! I really HAVE to share this.